4.45am. It’s match day. Not just any match day, second placed Hà Nội T&T travel to face off against top of the table Thanh Hóa. 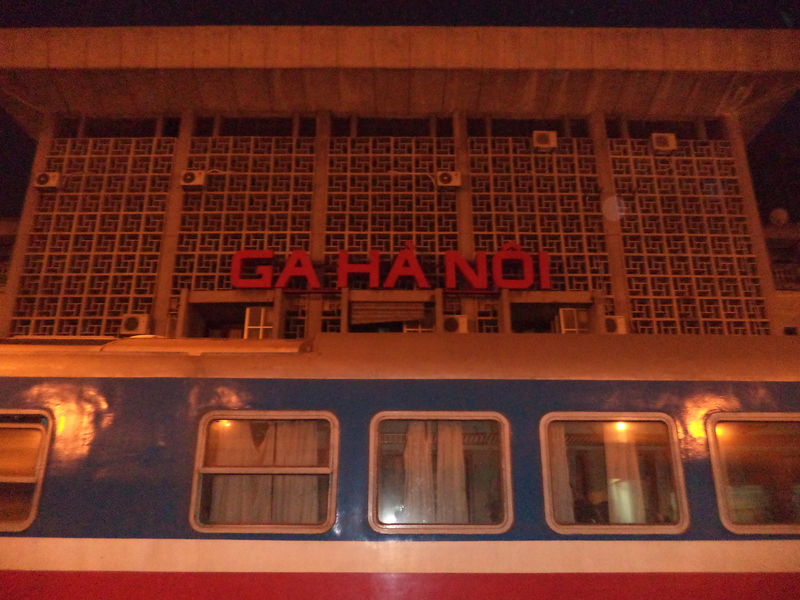 I’d decided to take the train to the game, 3-4hrs south of Hà Nội. It was cold and dark as I headed to the main road in hope of finding a motorbike driver to run me to the station. Being on the deserted streets of Ha Noi at this time made felt like I’d awoken in another city, I didn’t hear a single motorbike honk! The train journey was ridiculously cold and I’d begun to wonder why on earth I was doing this. Alone; cold and tired. To see a football match! I was reminded of a similar journey I once took leaving a rather wet & cold Southampton to travel the length of England to watch Arsenal play at a rather wet & cold Bradford City. I hadn’t changed. 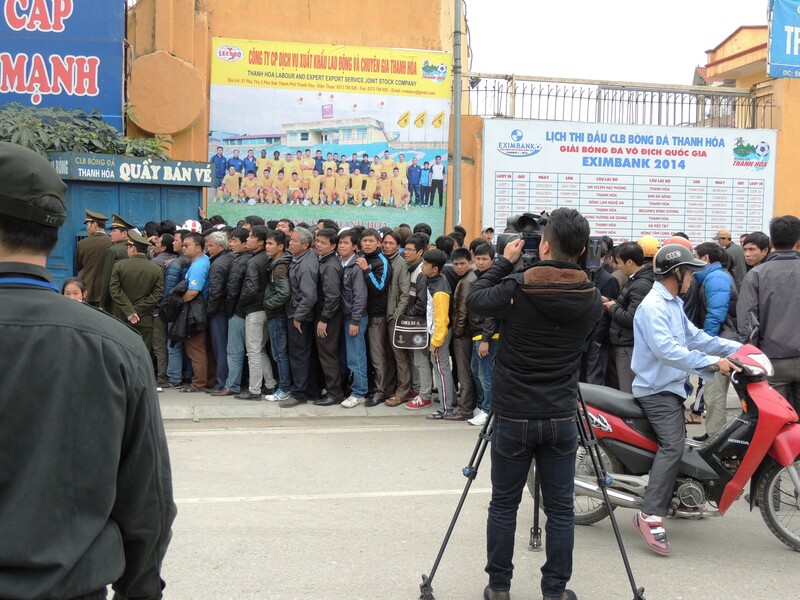 Over 2 hours before kickoff and the streets around the compact stadium were teeming with fans, all desperately trying to obtain a ticket for the big game. Huge crowds gathered at the small ticketing windows, jostling for position, elbows raised and some even climbed over those who dared queue in front of them. How on earth was I going to get a ticket? I’d no idea if the T&T Fan club would attend either. It turns out its quite handy knowing a player or two and a phone call was made on my behalf to the Fan Club organizer, who were in fact already inside. A huge steel gate (plus 6 policemen) stood between me and a spot on the terraces. Banging on the gate, using my best, yet limited, Vietnamese the policemen refused my advances. Fortunately ‘red wig man’, was looming in the background, grasping a ticket and beckoned me in beyond the confused police. Certainly the closest I’ve come to not getting in a stadium for a while. The games here last season ended in 3-1 win for T&T. I hoped for more of the same but the omens didn’t seem in our favour. Defenders, Gallagher and Quoc Long, along with central midfielder, Sy Cuong, were all suspended. Striker/captain/defender, Gonzalo, was still struggling with injury. Not ideal against an in-form side, who are yet to lose this season and boast the influential Nastja Ceh in their ranks, a recent player of the month winner. The game got underway and the hosts first forage into the T&T half was greeted with a great roar of encouragement from the home fans, who’d packed into every corner of this small and intimidating stadium. Even the rooftops of neighbouring houses were full. T&T then took a huge blow on 7 minutes as defensive replacement, Tien Dung, left the field injured. A minute later and we were losing. Ceh sent in a corner which Dutchman Van Bakel powered home. 0-1 down, with a depleted side, it didn’t feel too promising. T&T dug in though and created a few half chances. As usual the game became feisty; a nasty challenge from Hong Tien on Ceh resulted in the Thanh Hoa captain being booked for dissent. HT 1-0. 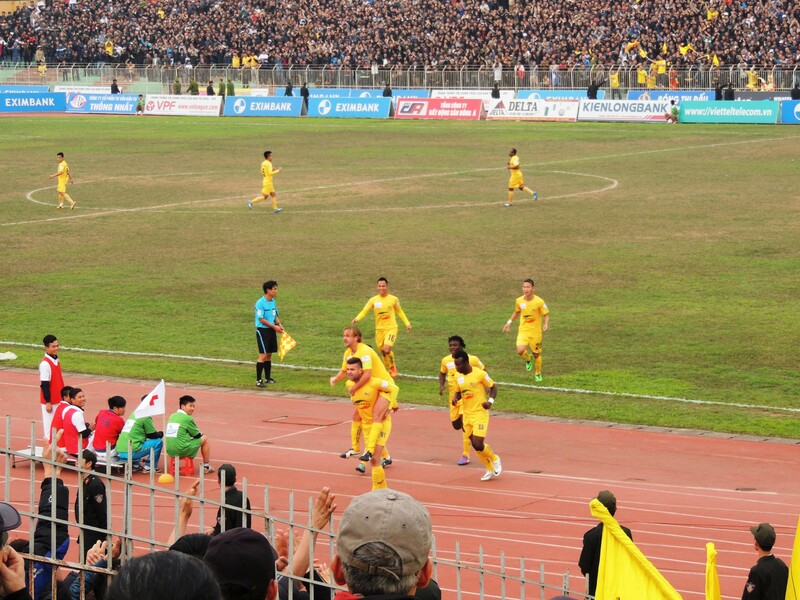 The game seemed sealed on 57 minutes as Sunday Emmanuel put the hosts 2-0 up, sending the 13,000 fans wild inside. Even though we were losing I was impressed with the passionate support for Thanh Hóa. As the end neared they would celebrate once more, as the impressive Ceh slotted home a penalty, with 5 minutes remaining. A dire half, for a Ha Noi fan anyway, suddenly picked up. Gonzalo came on. Samson pulled a goal back and belief seemed, for the first time, sway to our side. 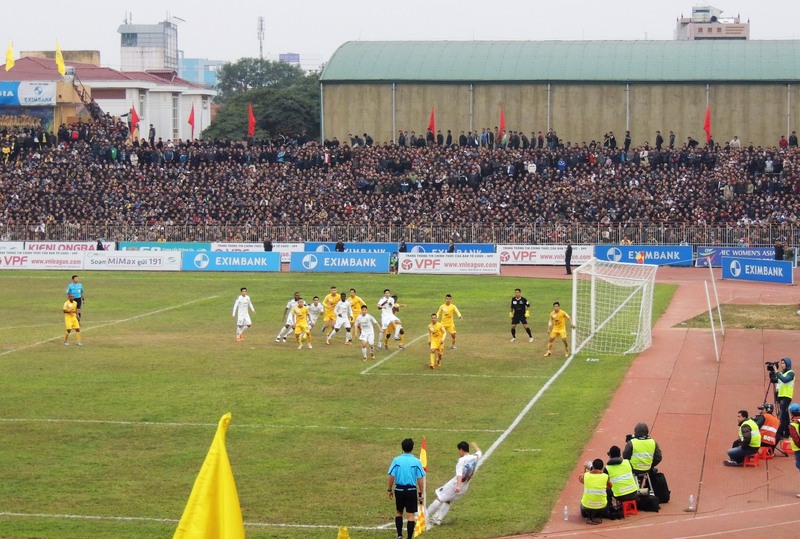 A goalmouth scramble saw the ball come back of the Thanh Hóa bar and the follow up narrowly go wide. It wasn’t to be though. 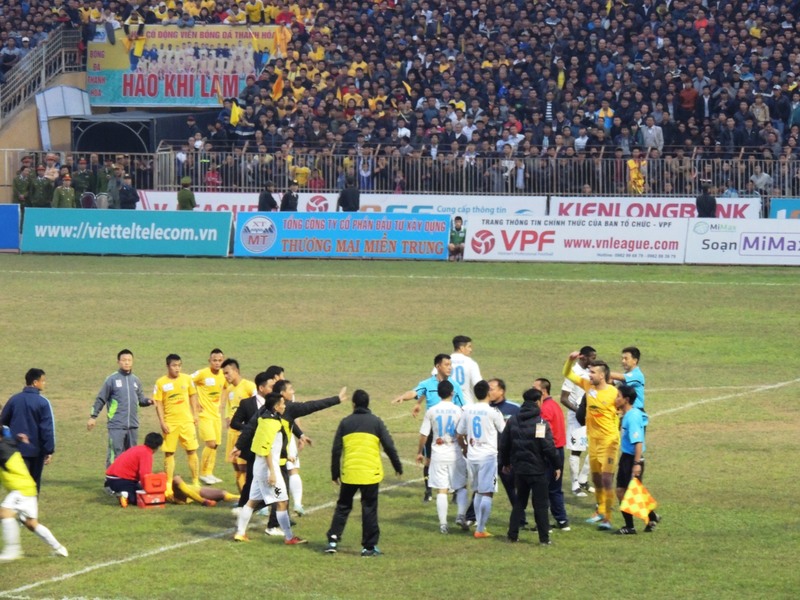 After this, Văn Quyết’s arm caught a Thanh Hóa defender in the face, sparking another ‘huge brawl’ (more like kids on the playground), with officials in suits and coaches racing on to get involved. A ridiculous scene. I’m sure the league will fine both sides. Overall, a deserved win for Thanh Hóa, albeit against a weakened Hà Nội T&T. Hà Nội will now take a break from V.League action as scheduling seems to have given them a month off, allowing the champions a chance to focus on their quest for AFC Cup glory, starting with the visit of Maldivian side Maziya S&R this Tuesday (25/02).